Fourth Row Center: Film Writings by Jason Bailey: New on Blu: "Sherlock Jr./Three Ages"
Is there a better silent comedy than this one? Chaplin’s City Lights or The Kid may have been more poignant, Lloyd’s Safety Last! more thrilling, Keaton’s own The General grander, more epic. But you’d be hard pressed to come up with a vintage comedy more delightful than this one, which packs endless laughs and startling cleverness into its brief, 45-minute running time. It was the third feature comedy for Keaton (not counting his acting-only appearance in 1921’s The Saphead), who was still navigating the line between the anything-goes gagwork of his two-reelers and the narrative discipline necessary for feature comedies. Here, Keaton and his gagmen hit upon a story that allowed them to do both. Here, our Buster is a motion picture projectionist who fancies himself a part-time detective. Neither job has exactly made him a rich man, though his best girl (Kathryn McGuire) doesn’t seem to mind. However, his rival (Ward Crane) decides to impress her with an elaborate box of candy—paid for by a pawned watch, stolen from the girl’s father (Joe Keaton, Buster’s dad). When the father realizes his watch has been lifted, Buster offers his directorial services, but the rival slips the pawn slip into Buster’s pocket, implicating him as the thief. Discouraged, Buster goes back to work, but when he falls asleep at the projector, he imagines the figures on-screen as the girl and the rival. As a director, Keaton beautifully constructs this narrative artifice, intermingling his world with the one on-screen, as his character removes himself from his slumbering body and runs up the aisle to get in on the action in the movie. The sequence in which he tries to do so is the film’s most iconic, and justifiably so—few images in his entire filmography are as memorable as his solemn figure jumping into the movie, and then being knocked about by the location shifts allowed by the editor’s scissors. Poor Buster is bounced from cliffs to waters to forests to busy streets, and the technical wizardry is astonishing, particularly for the time period (Keaton’s cinematographers reportedly used surveyor’s instruments, since the effects had to be achieved in-camera). But Keaton also knew that he couldn’t just blow us away with the cleverness and the film technique—all of that had to be flawless, and the sequence had to be funny on top of that. It is. And then, once he had moved the story into both the dream world and the movie world, he could get away with stranger (almost surrealistic) bits, like the trick-shot billiards scene or the old-lady-dress-in-the-window escape gag. Throughout the entire movie-within-a-movie, we’re charmed—by the speed of the narrative, the cleverness of the jokes, and the hilarity of the entire enterprise. 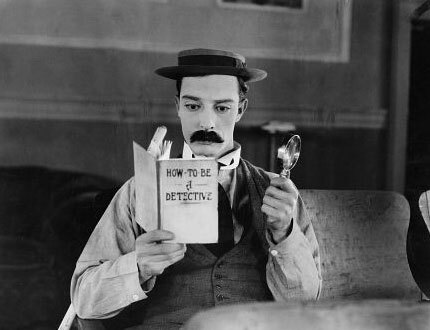 Sherlock Jr. originally ran about six reels, a more common length for a feature comedy, but Keaton was merciless in his editing, taking out every second that didn’t play, sculpting it tighter and tighter until it ended up running barely over four reels. As a result, the movie never slows down; it’s constantly surprising us with its ingeniousness, and even when it arrives at the climactic motorcycle/car chase, Keaton doesn’t just see it as an opportunity to thrill us with his expectedly impressive stunt work. He does that, but he sees the sequence primarily as a clothesline for gags—and all of these are keepers. By the time Keaton returns to the wraparound story, it’s mostly tying up loose ends—we know the good-hearted girl will return to Buster, and that they’ll live happily ever after. In Sherlock Jr., Keaton goes a step beyond that tidy resolution, constructing something akin to a meta-movie moment. The girl arrives in his booth just as the figures on-screen are having their inevitable happy ending as well; poor, sweet Buster, always sympathetic but (and this is key) never asking for our sympathy, isn’t sure quite what to do next. So he glances out, through his projectionist’s window, at the action on the screen; when the movie’s hero takes the girl’s hands in his, he does the same. When the hero moves her hair, touches her face, he follows suit, and so on. Seldom has a filmmaker so eloquently yet simply expressed how our actions and behaviors are dictated by the culture around us—how all we know how to do, whether we’re playing it cool or throwing a punch or kissing the girl, we learned from watching it in a movie. And then he explodes his commentary, with one last, satisfying laugh. Presumably due to the film’s abbreviated running time, Kino has paired it up for this release as a double feature with 1923’s Three Ages, Keaton’s first self-generated feature comedy. Somewhat gunshy about the transition from two-reelers, Keaton hedged his bets a bit with this spoof of Griffith’s multi-period epic Intolerance; if it didn’t work, he figured, he could just release the three tales of love through the ages as individual short films. The titular periods are the Stone Age, the Roman Empire, and “the present age of speed, need, and greed.” In each story, Keaton is the love-struck boy, Margaret Leahy is the girl he loves, and Wallace Beery is the villain, a stronger and tougher contender for the girl’s hand. The gags are still very much in the two-reeler vein, which is to say, slightly cartoony (you can draw a straight line from the shot where Buster falls off a cliff, looking up at the camera and blowing a kiss, to countless similar shots in the Looney Tunes library); there is also a flash of period racism, in an unfortunate joke with about a Roman dice game. But if the laughs are more strained in Three Ages, it’s mostly due to the confines of the structure. Though the parallelism of the tales is a clever conceit, the picture lacks the smoothness of his best features, and it begins to feel more rote as the film goes on—at least in the specific way that each situation and scene must have an equal in the other two stories. There is some great stuff here, though. That baseball gag still kills, and the bit where he gives the lion a manicure is a scream (in a very Muppet-esque way). The famous roof jump (wherein Keaton reportedly missed his mark and decided to rewrite the end of the stunt) is a deserved highlight, and there’s a wonderful symmetry to the closing images. Three Ages isn’t quite Buster at his best, but mid-level Keaton is still a step above most comedies—then or now. Nearly 90 years (wow) after their original release, these Buster Keaton comedies maintain much of their original charm and hilarity. Kino’s preservation efforts also remain admirable and (for the most part) successful. This double feature is a tad lop-sided; for all of its virtues, Three Ages simply can’t measure up to the absolute delight that is Sherlock Jr. Then again, few movies can. "Sherlock Jr./Three Ages" make their Blu-ray debut on Tuesday, November 16th. For full A/V and bonus feature details, read this review on DVD Talk.